The future is bleak. You are the leader of a colony, doing whatever you can to get the resources your people need to get by. But you have dreams of a brighter future, one where your resources don’t all rot before you can use them, where robbers and swindlers don’t take your hard-earned things, and where your warehouse is much larger than it is right now and always full. You’re tired of your stuff breaking down, and you have just the right ideas for upgrading. It’s your colony. And it’s time to make it what you want. 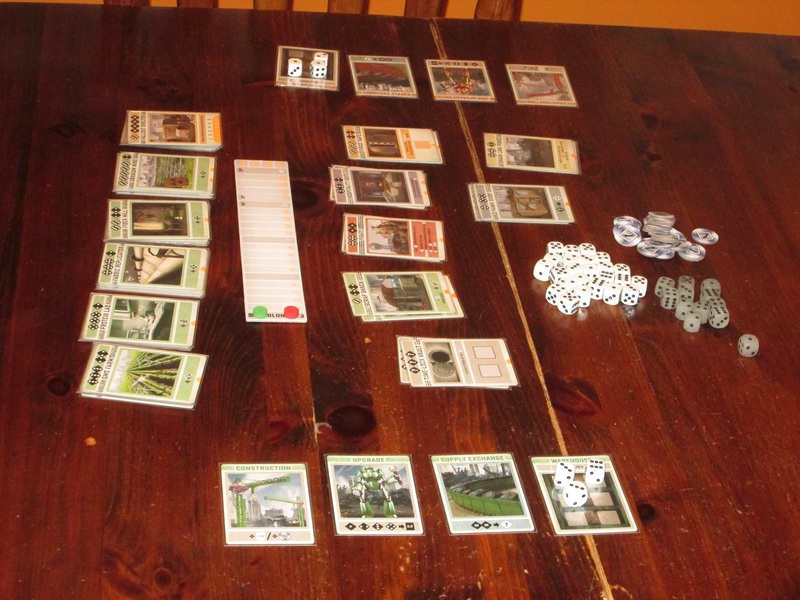 Colony set up for two players. 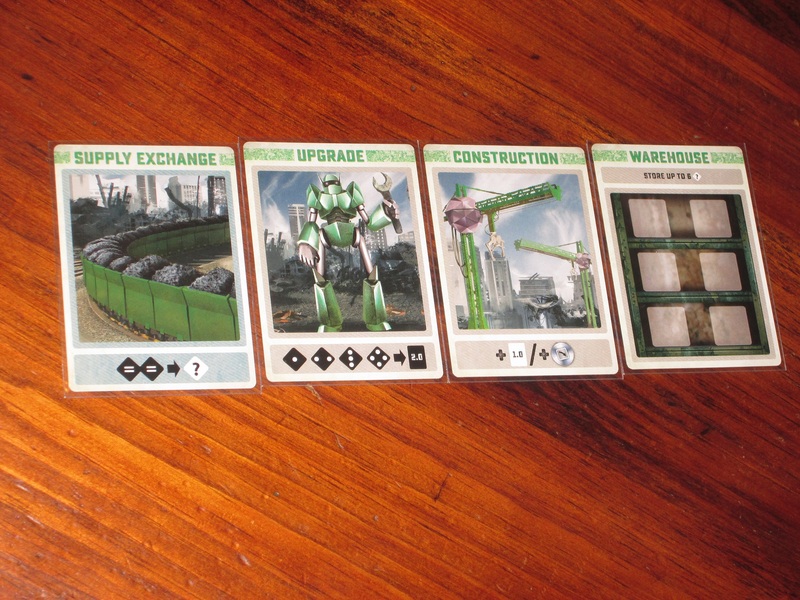 To begin, players each receive a construction, upgrade, supply depot, and warehouse card. They roll three white dice and place them in their warehouses. They set out the start cards included in every game and then seven variable stacks chosen at random, each with one card per player in it. Players choose a start player and begin. 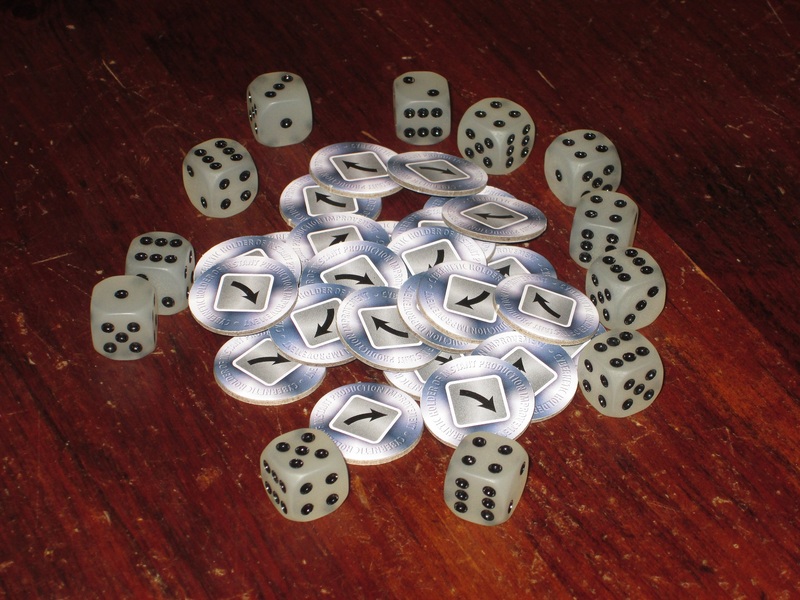 On a turn, players will roll three white dice (stable resources) and may pay up to three chips to roll additional frosted dice (unstable resources). The active player chooses one of the three white dice and passes the other two clockwise; the next player chooses one of these dice, and so on. 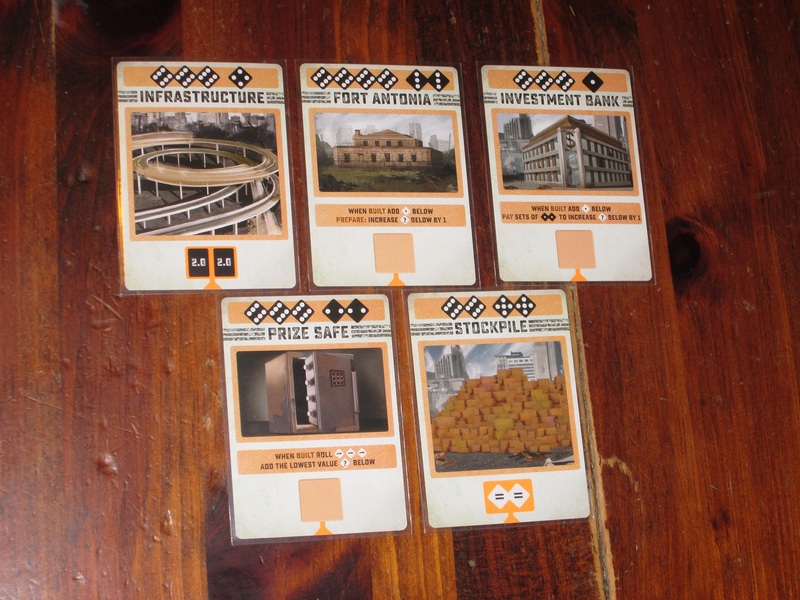 Then the active player may activate any cards in his or her tableau using stable and/or unstable resources. Unstable resources can be a boon, but they don’t stick around from round to round. Activated cards allow players to buy cards from the market, swap resources of one kind for resources of another kind, upgrade cards, or receive free resources. 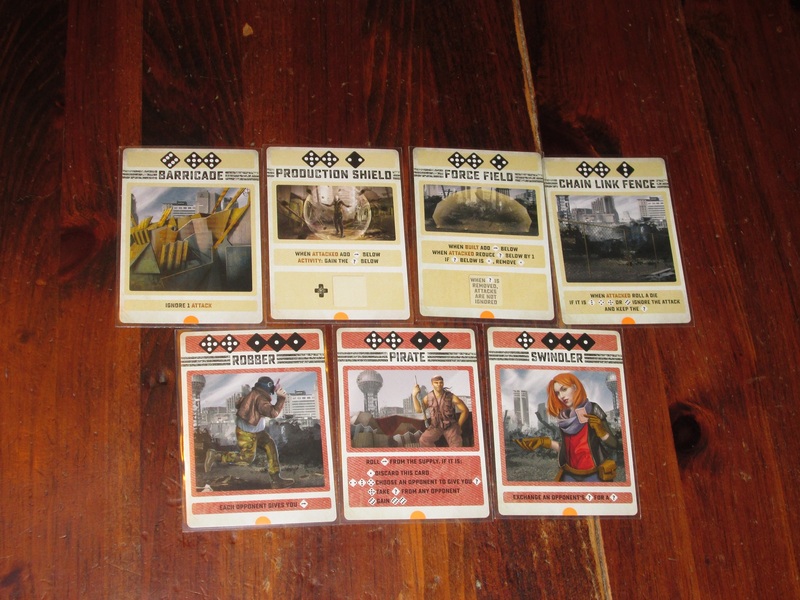 Each card in the game has a basic 1.0 side and an upgraded 2.0 side, and as the game progresses, players’ abilities will increase as they purchase and upgrade cards. 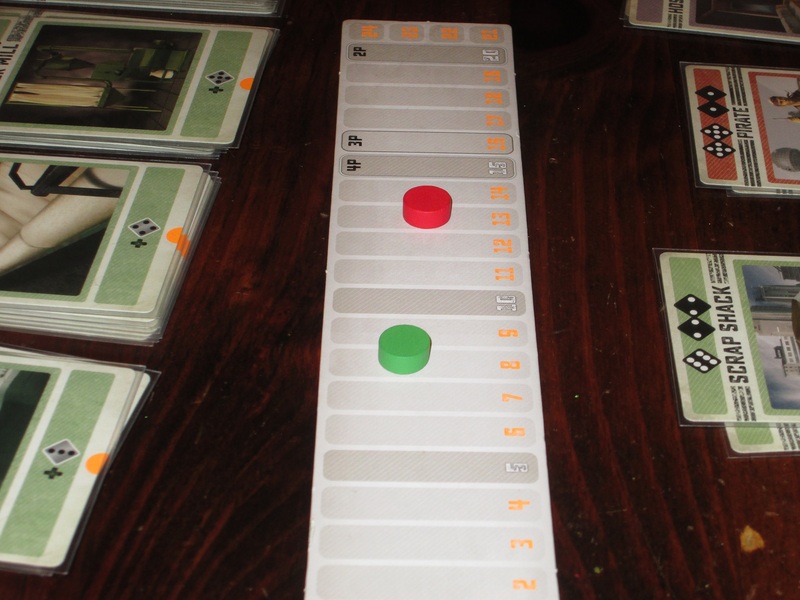 In addition to activating cards, once per turn the active player may discard one card from his or her tableau, removing it from the game, in order to roll stable resources equal to the point difference from the player in the lead. 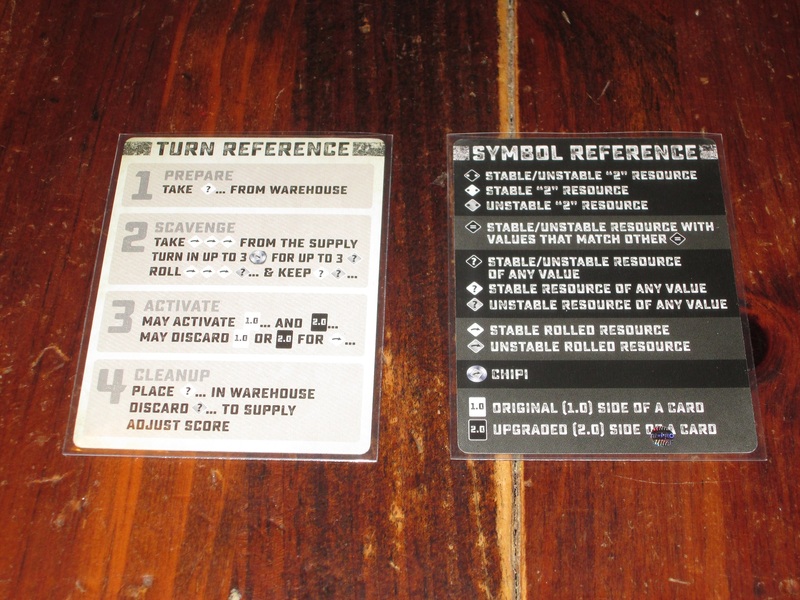 Once the active player has finished activating cards, that player’s score is adjusted, unstable resources are lost, and stable resources may be stored in the warehouse and other cards that allow storage. The game ends whenever one player reaches the scoring threshold dependent on the number of players. The player who crossed the threshold wins. Built in a Cave with a Box of Scraps, or I’m Not Tony Stark? One of my favorite games last year was Roll for the Galaxy, which surprised me as much as anyone. At the time, I wasn’t a huge fan of Race for the Galaxy, nor do I consider myself much of a dice fan. There was something about the rolling, though, that just worked for me. Rolling dice is inherently fun, but the ways to use the dice are what made Roll for the Galaxy a game I wanted to return to again and again. Once, as I was explaining the game to a coworker over lunch, I called Roll for the Galaxy a “dice game.” Another coworker who was sitting nearby said, “That isn’t a dice game. That’s a game with dice.” And I had to agree with him. While Roll for the Galaxy employs dice, it doesn’t feel like a dice game. 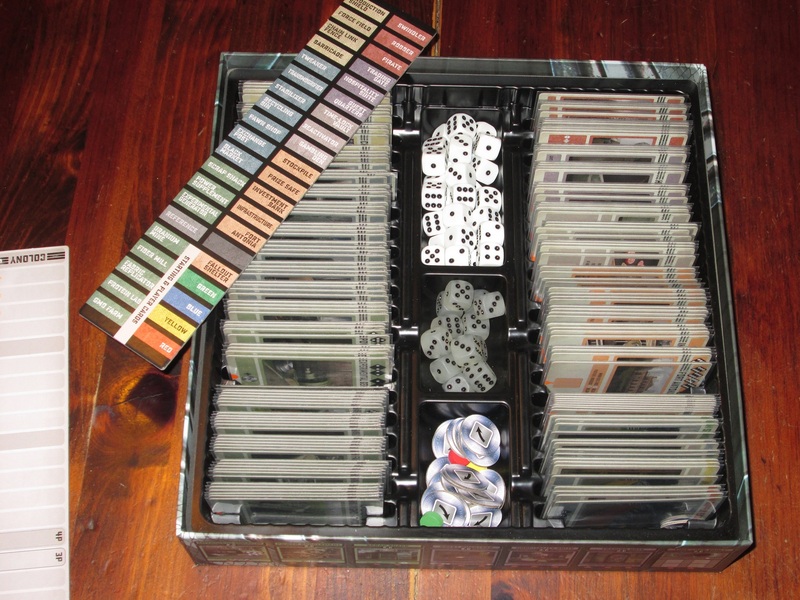 The insert keeps everything stored nicely–including all those DICE. This is what makes Colony a strange beast: it is most definitely a strategy game (ignore those who say otherwise), but it also feels like a dice game in a way that Roll for the Galaxy does not. Colony leans into its dice rolling–for better and worse. These cards allow you to change resources one for another and otherwise manipulate resources. These are my favorite cards in the game. 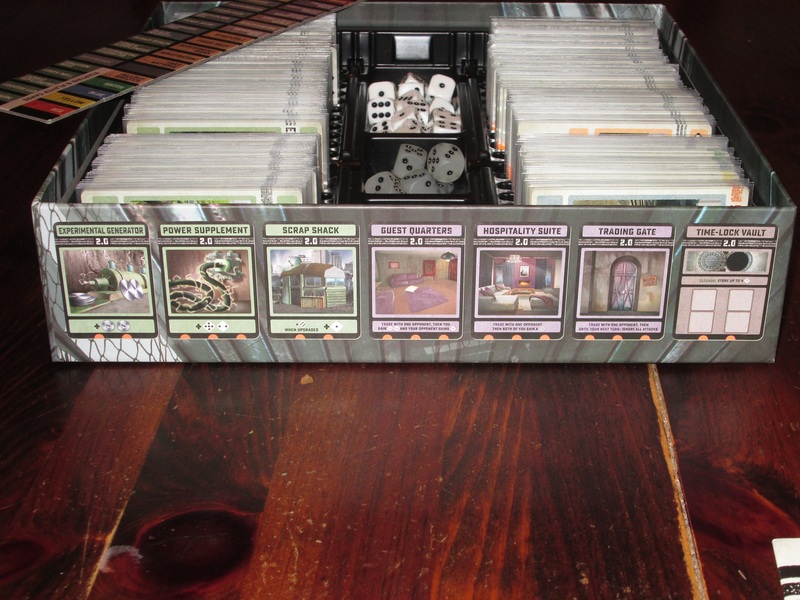 At its best, Colony is a fun game of rolling dice and making the best of what you have. Rolling dice is always fun, but making dice into a strategic game worth playing is not a simple task. 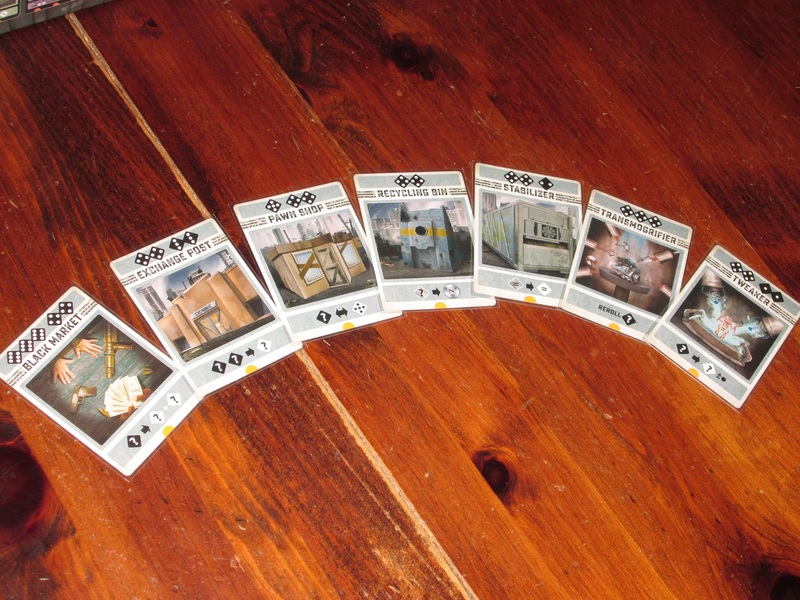 In Colony, there are several guardrails that keep the game from being a full-on luck fest: you draft dice, there are cards that allow you to convert dice, you can buy cards that give you certain numbered dice each round, and so on. On a spectrum from Las Vegas to Roll for the Galaxy, Colony is much closer to Roll in strategy, but it also feels more like a dice game than that. Your humble beginnings in Colony. The reason Colony feels like a dice game is that, while it’s possible to manipulate your dice to some extent, often you still need specific numbers to accomplish what you want to do. You begin the game with a few cards that allow you to do light manipulation, but even here you have to have specific numbers. Unless you construct new cards, what you roll is what you get. There are enough choices (and there is enough opportunity to improve your choices through saving dice or buying better cards) that, again, Colony isn’t a luck fest. But the dice are prominent on purpose. 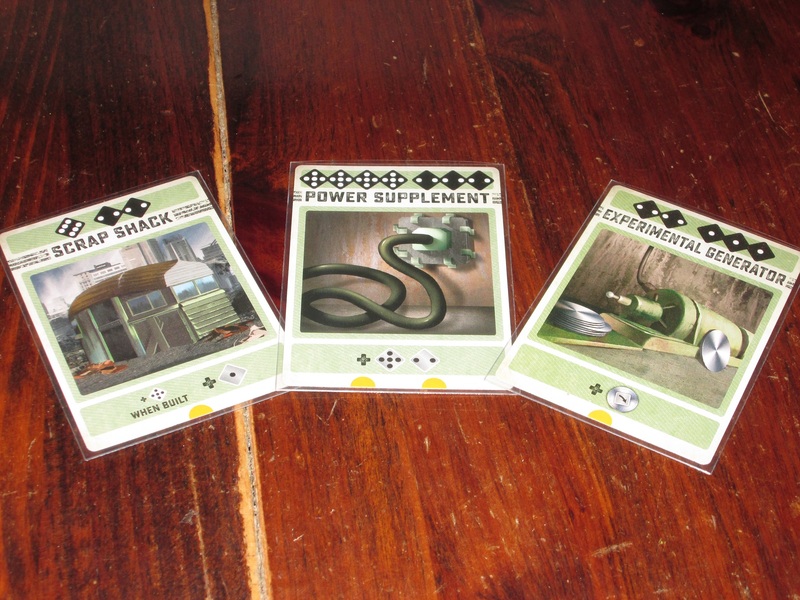 Green production cards give the player resources each turn when activated. The 1.0 side offers unstable resources; the 2.0 side gives stable ones. Even though it doesn’t necessarily feel thematic that 1s are “scrap” and 6s are “uranium,” Colony’s dice work exceptionally well as resources in a resource conversion game. I remember playing At the Gates of Loyang many years back, and while I enjoyed it, it was so fiddly taking one vegetable, placing it somewhere else to take another vegetable, and so on. Here, the conversion is simple: each die is a resource, and when you change it to something else, you simply turn the face. While custom dice seem like they would be nice here, the designer has spoken elsewhere that these were not as intuitive, and I can see what he means. The numbers are easy to interpret at a glance, even though they don’t immediately call to mind what they are in the scheme of Colony’s world. 1.0 Pirate and 2.0 Pirate. I love the subtle differences in artwork. It’s easy to tell at a glance 1.0 cards from 2.0. Perhaps my favorite feature of Colony is the upgrade system. Not only is this thematic (you’re fighting for junk and trying to improve it), but it is also one of the most satisfying things to do in the game. You begin with weak cards, and you make them stronger. At the start of the game, you can buy just one card per turn, you can manipulate only a pair of dice with the same number, you can store only six resources turn to turn, and upgrading is cumbersome. By the end of the game, you will have upgraded these cards and the cards you buy to make a more meaningful machine with many more options. By the end of the game, while you’re still rolling dice, you’re much more likely to get what you want, thanks to upgrades. Colony is an engine-building game, which naturally involves adding new parts to the engine, but I do enjoy the “fix it as you go” approach in Colony. You see a 5-point lead; I see an opportunity. One of the other neat features of the game is the discard mechanism. Once per turn, you can discard one card from your tableau to roll stable resources equal to the difference in points between you and the player in the lead. A player can take a pretty hefty lead with the right dice rolls in Colony (especially with a well-timed Prize Safe), so this method of discarding is a way to bring equilibrium to the game. Yet this isn’t a silver bullet. While I’ve used this option many times when I’ve felt strapped, it hasn’t made up for poor play. It has put me more in contention with the leader, but it has rarely (if ever) propelled me to the top spot. That being said, if I had been in a better position before this move, this could have been just the boost I needed. But that’s why I like this feature: it’s a gamble (which, let’s be honest, if you’re playing a dice game in the first place, you want this opportunity). It’s a risk that might pay off. But even if it doesn’t pay off, it’s exciting. You get to roll more dice that have the potential to change the game for you, yet in the process you have to forfeit one of your cards (and likely some points). It’s a Hail Mary move that offers a surge of adrenaline without breaking the game. 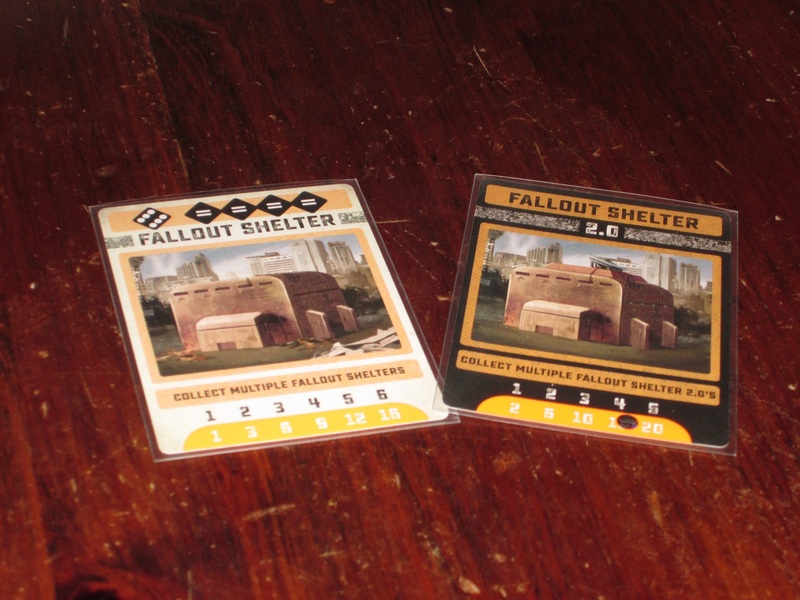 Fallout Shelters appear in every game and can be a good way to earn points. The orange cards are opportunities at big points…if you can pull off the requirements. The downtime problem is compounded by the resource manipulation, which has a tendency to induce analysis paralysis. Again, comparing to Dominion: Dominion has a single currency, and you get to see your hand in advance. While there are some decisions that you make in the moment, much of your turn can be decided in advance. But in Colony, because cards cost different amounts of resources and different resource numbers, and because you can never be certain what resources you’ll have when your turn rolls (!) around, much of the individual deciding has to be done in the moment. This isn’t necessarily worse; in fact, the dynamic resources and resource conversion are things to recommend Colony, if that’s what you’re after. But do be aware that it can be slow, especially with players who are already prone to excess deliberation. Colony isn’t multiplayer solitaire, but it sometimes feels like it because decisions can take a while. The player aids are handy, but only two are included in the game. Thankfully, the rules are pretty simple, and the iconography is clear. The game also is a little slow to start. The first turn you won’t have many resources or options, and as the game progresses, your options slowly escalate. This is part of the fun of an engine-building game–you get more efficient as you go!–but it can almost cause despair at the start of the game. “I have to get how many points to win? !” All three of these potential issues work themselves out over multiple games. You get better at knowing which cards you’ll want, which resources you’ll need, and how you might get them if they aren’t rolled. You get faster at making those initial turn decisions, recognizing that your colony won’t be built in a day, and it becomes easier to see how you might procure needed resources. But do be aware that the first game or two can be a bit of a slog. The wrap of the box bottom shows you the cards that are inside the box. And of course, if you don’t like dice to begin with, Colony may not be for you. While there are many ways to mitigate bad luck, Colony is very much a “roll dice and use what you’ve got” kind of game. Notice I didn’t say it’s a “roll dice and see what happens” game: there are real choices in Colony, and the winning player will be the one who makes better choices with what is rolled. There are lots of ways to make what you’ve rolled what you want (at least if you get the right cards from the supply). But there can be times of frustration when you don’t roll what you need and your opponent does. Some will think this is a bug; I think this is a feature. The entire game revolves around the “dice as resources” conceit, and the game is in spinning the dice in ways that even a “bad” roll is good. It’s not as forgiving as, say, My Village (where what you roll hardly matters because there’s always a good-enough option to take), and I think it’s better for this occasionally biting approach. I usually don’t include the trading cards in my games, but your mileage may vary. The game includes lots of options for customization, and your group will likely decide quickly which cards they like and which ones they don’t. I tend to favor manipulation cards. I don’t like (and so usually don’t include) the trading cards: I find that they both slow the game down and render less important the best part of the game (resource manipulation), although their lower cost and high point value can be a boon. The attack cards similarly won’t be for conflict-averse groups, and others who like strong attacks might want to avoid the defensive cards, which are quite strong in Colony. All of this to say, you probably won’t like all the options in the Colony box, but thankfully, there are lots of opportunities to customize (twenty-eight, to be exact), and you’re bound to find a combination that your group can enjoy. You can even change the points threshold that you need to finish the game (if you find your games are too slow or too fast). 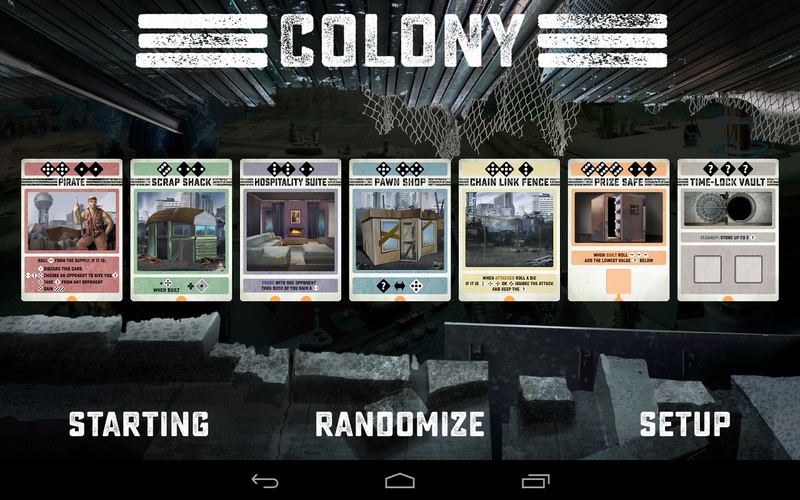 Colony relies on a free app to randomize cards. While the app works fine (and is a nice touch if you own a smartphone), it’s a little cumbersome for me since I have to drag my tablet along with the game box. The game relies on a companion app for randomizing cards, which works well on my tablet (and you can tell the randomizer to turn off cards you don’t like). I would have preferred an in-box solution for randomizing cards, but I’m one of the only people in my circle without a smart phone (hence why I had to drag along my cumbersome tablet): take what I say here as a curmudgeonly voice crying in the wilderness. 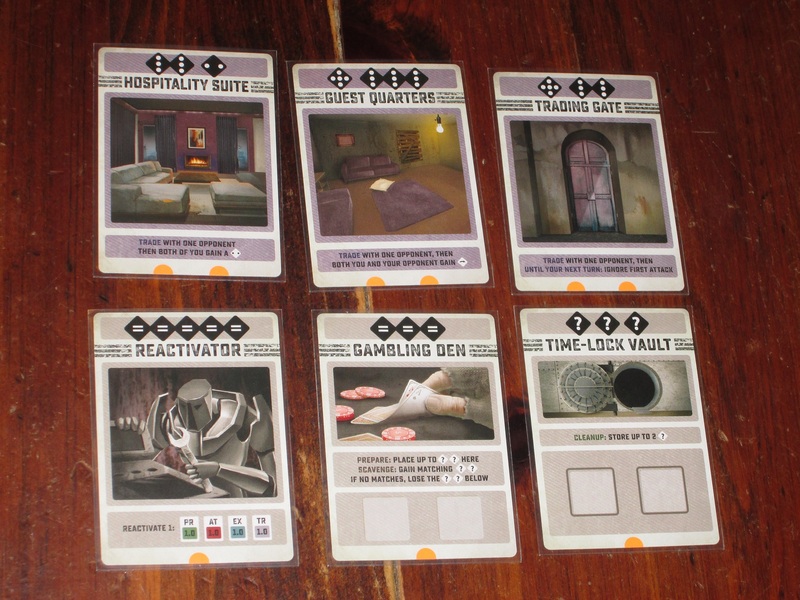 The attack and defensive cards in Colony. Again, your mileage may vary with these. The components in Colony are excellent. The dice are large enough that they’re easy to see and manipulate but small enough that they don’t take up all the space on the table. The illustrations on the cards are great, and while Colony doesn’t evoke theme in its mechanisms, the artwork provides a nice thematic backdrop. 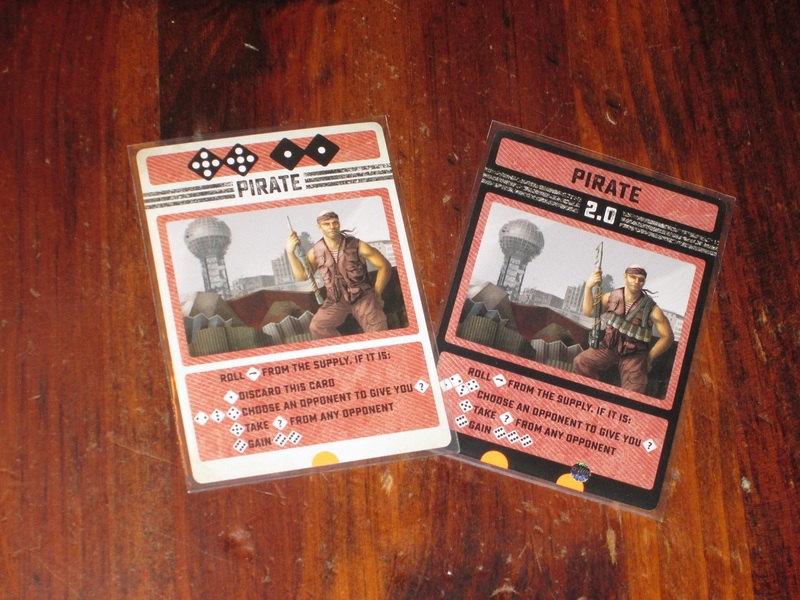 I especially love that each card has a 1.0 and a 2.0 version, and the 2.0 illustration is a subtle variation on 1.0. (The Pirate, for example, is wearing lots more ammo in the 2.0 version.) The chips are a good heft, and while I sleeved my cards, this probably isn’t strictly necessary; the cardstock seems good enough quality to stand up to multiple plays, and cards remain mostly stationary throughout the game. 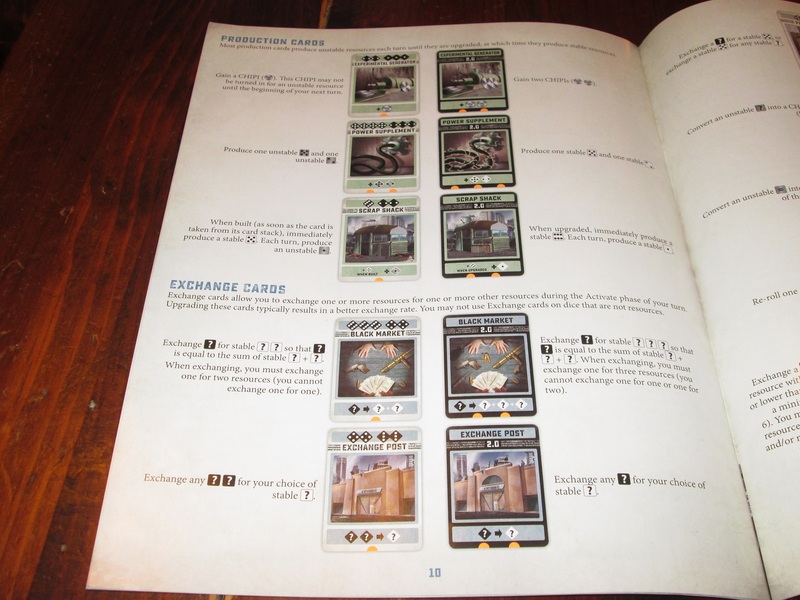 The insert here is fantastic, with slots for each card and an organizer showing where each one goes. The label telling which slot each card goes into is thick cardboard, so it acts as a seal for the dice, which mostly stay beneath it, even if the box is overturned (but don’t be cavalier here: the dice can escape, and it’s messy when they do). Colony has a solitaire mode baked in. The solitaire rules are a fun puzzle. Colony has an extensive glossary of each card. 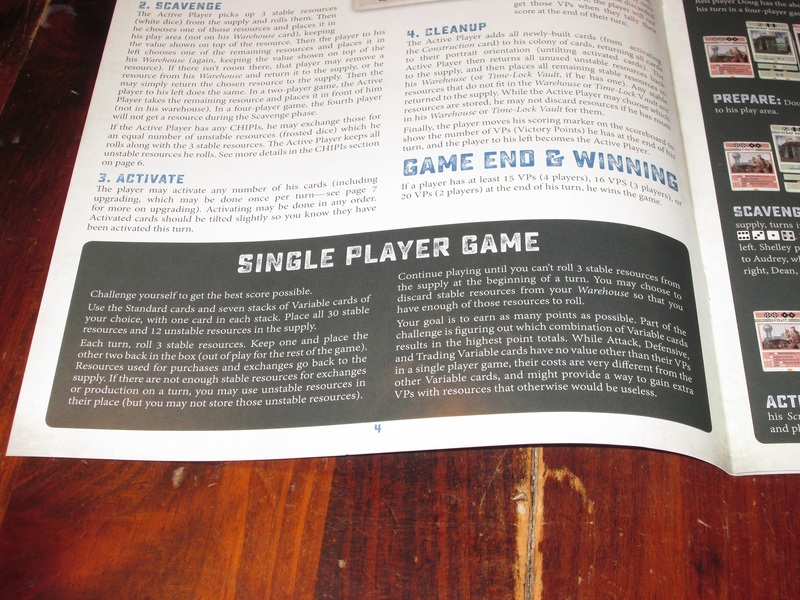 The rulebook here is excellent and exhaustive. As it stands, Colony is a sound game, and I think it will be perfect for players who like puzzly games and dice and don’t mind a little downtime between turns. One of my friends who loves Uwe Rosenberg’s games (Rosenberg is the king of resource manipulation) and Castles of Burgundy (a dice-driven Euro) really liked Colony. Another friend who is more a fan of card combos and traditional engine building enjoyed Colony but said he would choose other engine-building games over it. I think their opinions are representative: if you like games of converting one resource into another resource in order to get what you want, you will likely love Colony. If you’re more a fan of card combo engine-building, Colony might not be enough to tempt you away from games in that vein that you already like. For me, while I like Colony, it is an “in the mood for it” kind of game, not one I’m always itching to play (but I, too, fall on the card combo side of the discussion). The game lasts a little longer than I want it to, and downtime keeps it from hitting the addictive “just one more game” window for me. But if you like puzzly dice and resource manipulation, you will definitely want to check out Colony. 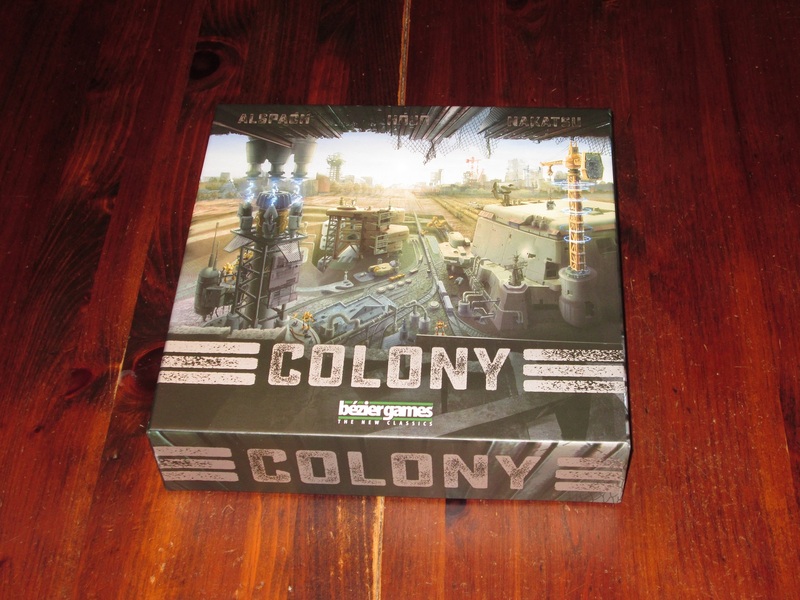 iSlaytheDragon would like to thank Bezier Games for providing us with a copy of Colony for review.